What I’ve Been Reading … and why! 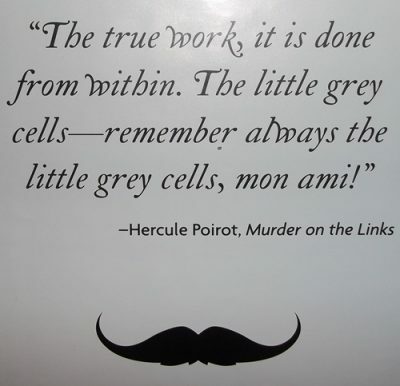 I have been reading ALL the Hercule Poirot novels (after having read all the short stories last year). I started with the first, Mysterious Affair at Styles, and am currently in the middle of Hallowe’en Party, (so only two left after that). That is, I have read 35-1/2 novels this year, all about the same guy … all with a bit of mystery … all with a bit of humor. 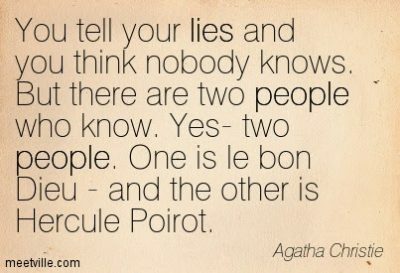 I have always loved Agatha Christie’s writing, but usually preferred the cozies of Miss Marple (especially since she always had knitting with her) and her Tommy and Tuppence books (really spy novels rather than mysteries). But my love affair with Hercule began when I started watching the BBC series with David Suchet, the consumate Poirot. No one else has been able to capture Christie’s character as well as Suchet: his prissy walk, his conceit, his whole bearing are just as I picture Poirot. But to prove that, I decided to re-read all the Poirots (and get a handle on just how Christie was able to create such a believable character who, altho caricatured in spoofs and graphic novels, is still a realistic gentleman detective). And so I started. And I have enjoyed each and every novel … and am looking forward to reading them again at some point! Poirot’s character can be annoying … conceited … overbearing … a bit too omniscient. But just when you’re ready to get REALLY annoyed, the denouement occurs, Poirot does something uber human (and/or humorous), or the reader is so surprised by the explanation that all is forgiven. Poirot’s character, and Christie’s portrayal, grows better and better until you know this guy … you want to invite him for tisane or sirop … you want him to fix your own problems. I also really appreciate that Christie gave her Beligan emigre sleuth a deep, Catholic faith. Christie herself was raised as a CoE Anglican but was had close friends/relations who were RC. Poirot’s faith comes out more and more as the detective (and his creator) age and begin to stare his mortality in the face. The addition of Poirot’s religious belief system is so natural … and developed so well … that the reader understands that Poirot is not just catholic, he is CATHOLIC and not ashamed of that. 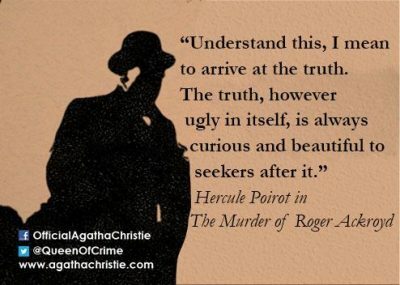 Here is a great blog post from the Agatha Christie Limited website that explains how, some 100 years ago, one of the most prolific mystery writers of the 20th century created the idiosyncratic Hercule Poirot! So that’s what I’ve been reading … and why. What are you reading?